Summary : The first American outpost of this international chain was disappointing. Miami isn't a great city for pizza, but this was an inauthentic tourist trap. Regardless, it might be the best Neapolitan spot in town. I recently spent a weekend down in Miami, Florida and wanted to hit up at least one pizza place while down there. After a bit of research (including the Miami Herald’s Pie In The Sky and Slice’s The United States Of Pizza: Florida), I decided that Fratelli La Bufala (437 Washington Avenue) would be a good place to try. I knew that it was in the heart of South Beach and would most likely be a tourist trap, but I’d heard some decent reviews and figured if it’s not Miami’s best… at least it’s one of the city’s most popular pizza places. I’d read online that if you check in on Foursquare – which I don’t typically do — you get a free bottle of wine. Some nice incentive to stop in. I’d also read a lot about the quality of the cheese they use there. Our waiter told us that the cheese on our pie had just arrived yesterday from Italy. I couldn’t help but think that was simply a gimmick. It might impress a typical tourist… but not me! My parents and I decided to split two pies. One was a Margherita ($11.00). The other one wasn’t on the menu. 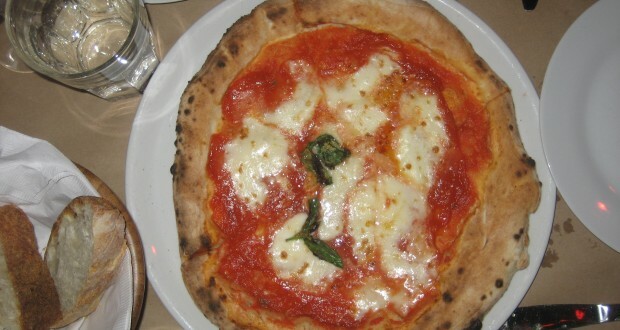 When I asked the waiter what his favorite pie was, he told me it was called Alla Caprese ($17.00). Essentially it’s a Margherita pizza, but after it comes out of the oven, additional mozzarella is added along with tomatoes. The enthusiastic recommendation convinced me to go with that, depsite it’s similarity to the Margherita. While our pies were being made, we ate a Mediterraneo salad which contained greens, tomatoes, and mozzarella. Unfortunately, some of these same ingredients didn’t transfer over to the pizza as well. I was especially disappointed with the Alla Caprese. The extra mozzarella and tomatoes didn’t add any new flavors or kick to the pie. They just made it less convenient to eat. It’s a good thing it’s not on the menu. The tomatoes in our salad — which were quite tasty — were bright red and flavorful. The tomatoes on the Alla Caprese looked discolored and were of much lower quality. Fratelli La Bufala isn’t somewhere I’d suggest people go for pizza. Perhaps you’d have better luck with some of their other items though, as they do serve a full Italian menu. They have many other locations around the world, although the Miami spot is their first within the USA. Among dozens of locations in Italy, there are restaurants in Barcelona, Dubai, and Istanbul. It’s the only Neapolitan pizza chain that comes to mind. But perhaps there’s a reason for that though. The bigger you get, the less quality control there is. And what I ate at Fratelli La Bufala was definitely not quality pizza.